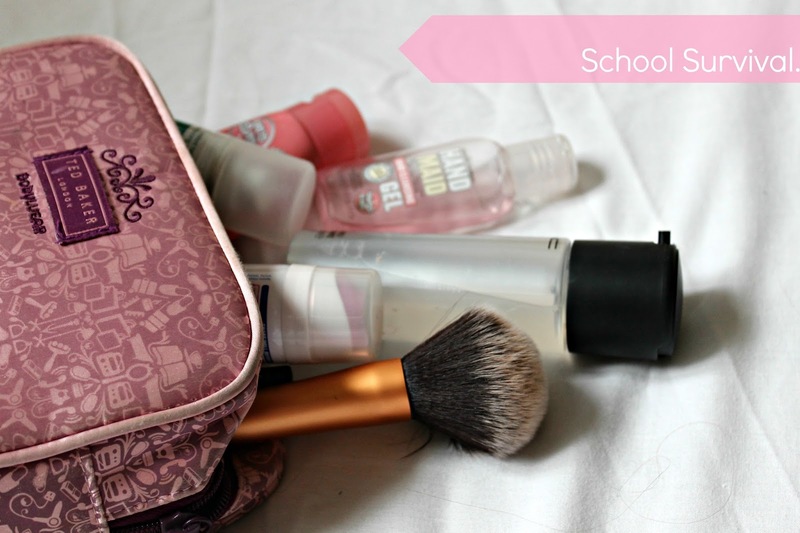 SARAH ELIZA: School Survival: Hair and Make-Up Essentials. I feel like I'm a bit late making a series of back to school posts but seeing as I've only just started school again and the tips I'll be trying to give you are for all year round, I'm sure this may come in handy to some of you! I think this series will have 3/4 parts to it including this post and then posts on stationary essentials, some general tips on how to survive school and I'm thinking of also doing a playlist post, which I haven't done in a while, for songs I listen to on the way to school and finally, maybe a few lunch box ideas but I'm just going to roll with all of this and see what happens! I'll probably try to post them in the matter of a week or so, so then I can get right back into my normal posts! Like I mentioned, this post is entirely aimed at mainly the beauty side of things- telling you what I'd wear myself to school and some little essentials I'd suggest to you to keep in your school bag. I guess it's probably best to mention that I tend to not really wear make-up to school and when I do only a bit. The reasons being that I like that wearing make-up to me is a little bit of a novelty and so not wearing it everyday doesn't wear out the novelty; the main reason why I don't wear make-up though is that, along with other schools, my school is very strict on make-up and jewelry as we have a uniform and so we don't get to wear what we like everyday. So for me, and others in my situation, means that there will be no smokey eyes or contouring when wearing make-up for school. However, I have also included a few things that, if I was allowed to wear little more, I would include in my school make-up routine. So let's start! Starting with what I would leave the house wearing on my face; after completing my morning routine and applying my primer, I will apply my Barbara Daley foundation which, for me, is a light coverage foundation which I bought from my local Tesco. I then apply my Collection 2000 concealer to any blemishes and also under my eyes. I will finish the base by setting it all in place with my Rimmel Stay Matte powder. For me, there will be no eye shadow, eyeliner or mascara so I would just curl my eyelashes and draw in my eyebrows using the Avon Glimmerstick Brow Definer and that's me all done! However if you are wanting to have a little more, of course feel free to! I would suggest, for eye shadow, using one of the Maybeline Colour Tattoos ( I have eternal Gold which is nice and subtle with a hint of glitter!) because they are quick to use so you can quickly put some on if you're late for your bus. To make sure my make-up stays nice all day long, I will take in make-up bag my concealer and powder just to touch up during the day because I don't want to fully re-do my make-up with foundation and everything because there's more chance of me getting it wrong and looking a little bit silly! If you're someone who likes a little more make up or is allowed to, I would suggest trying the Sleek Face Form Palette as it includes a bronzer for contouring, highlighter and a blush so it's perfect for school as it is all easily compact into one palette so it's easier to carry it around instead of 3 separate pots. Along with the powder and concealer, I would also suggest taking a lip balm of some sort - I'd suggest the Palmas lip balm because it's nice and moisturising; if you're wanting a little more colour I'd maybe try getting your hands on the Maybeline baby lips or their lip butters to add a little tint of colour. Hand sanitizers become my best friend along with hand cream and so I immediately jump to taking my Soap and Glory hand gel and hand food purely because I know they work and smell amazing! Another essential for me is my Mac fix+ as it can stop your make-up looking cakey and so less noticeable as well as being a nice face refresher during the day. Deodorant is a must! Especially on P.E/ gym days when you are hot and sweaty. Along with maybe a body spray or perfume you'll be smelling all clean and fresh all day long! I'm not a big hair person and will still to the same hair styles during the whole school year but I'd suggest making sure you're stocked up on hair ties and bobby pins. I also tend to include a dry shampoo just in case my hair gets a little greasy or oily during the day; along with a hair brush (of course this means my tangle teaser) I won't be having any hair catastrophes anytime soon! So That's all for this post! I hope you manage to take at least one little thing away from this. I'm aiming to post the next part of this series on Monday so look out for that! What do you wear to school?